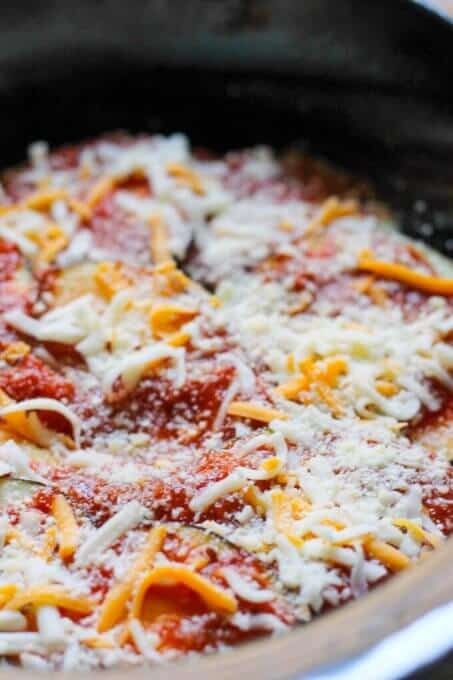 Slow Cooker Eggplant Lasagna is my newest creation and is perfect for busy weeknight dinner during the summer. Yes, you heard me right, this is a perfect dinner for the summer. Why? 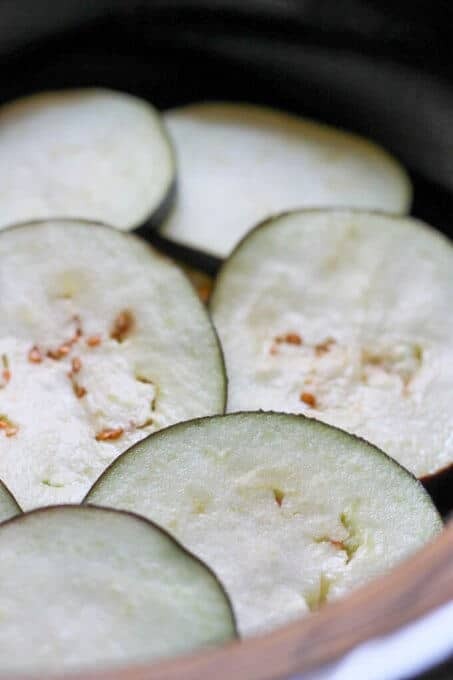 Because eggplant is in season and is most flavorful this time of the year. 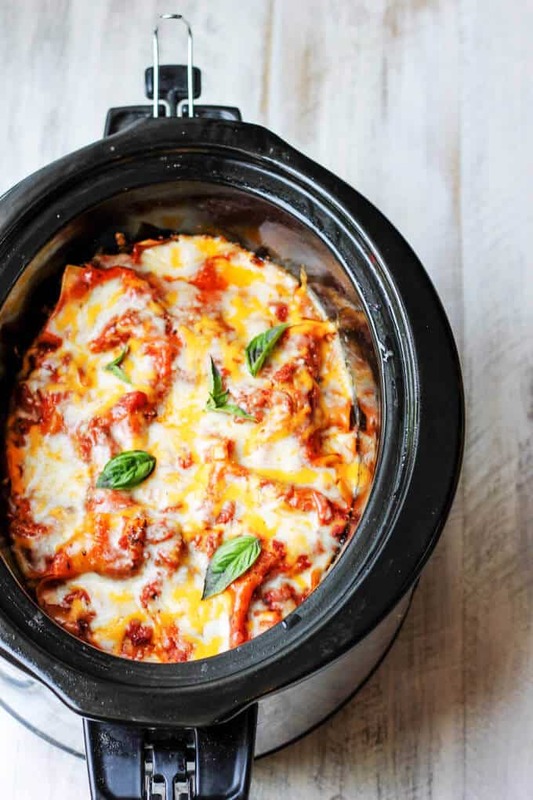 In that you don’t want to fire up your oven this time of year, the slow cooker will substitute perfectly for you. And if you’re like me, and like to grow your herbs over the summer, you’ll have plenty of fresh basil. It’s super simple. 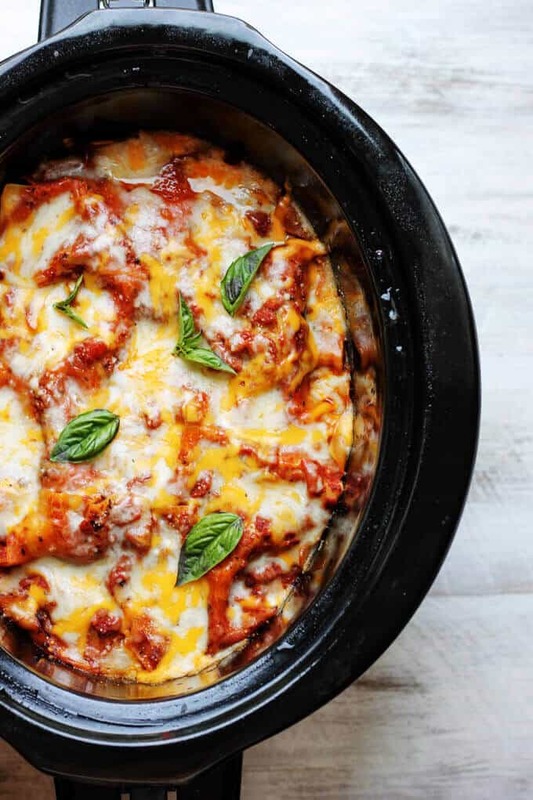 You’ll need to slice up the eggplant first and salt them on one side – wait 10 minutes – turn and salt on the other side – wait another 10 minutes – rinse it, and you are ready to assemble your Slow Cooker Lasagna. 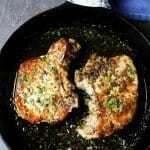 I provide a detailed description with step by step photos in the recipe below. When Summer finally arrives I really like to utilize the seasonal ingredients which are so bountiful. 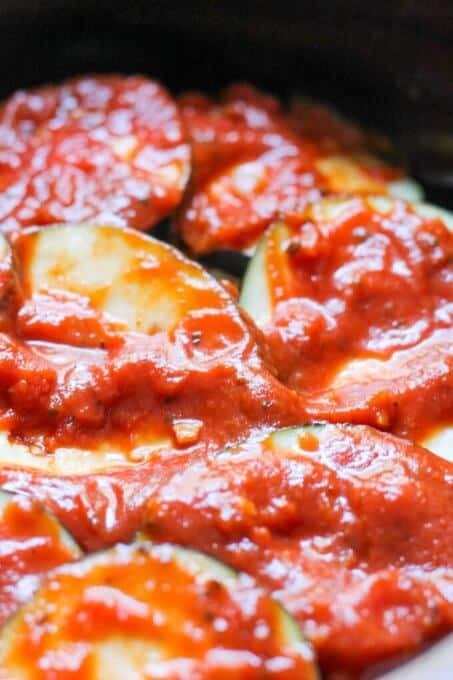 One of my go-to dishes, using vegetables straight from the farmer’s market, is this Hungarian Lescho (Tomato and Peppers Stew), but I also love this wonderful Turkish Inspired Eggplant too, which is seasoned with cinnamon and topped with feta. As the summer winds on, and when tomatoes are ripest, I need to make my absolute favorite pasta dish: Penne Alla Vecchia Bettola. It’s an Italian pasta with vodka sauce – but I used fresh tomatoes from my garden. 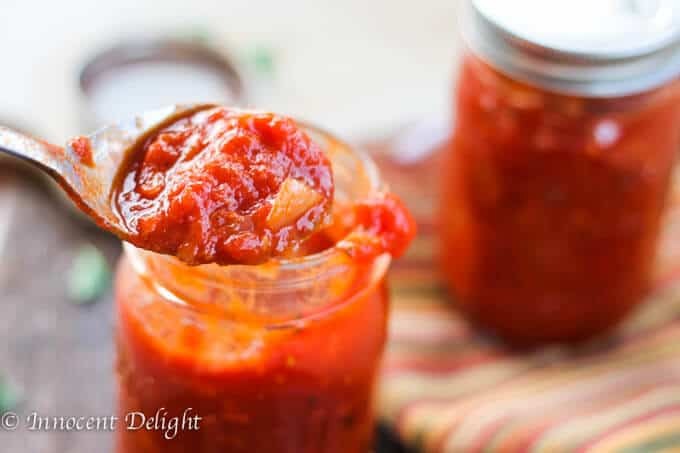 This is one of the most popular recipes on this blog so you may also want to check this out. 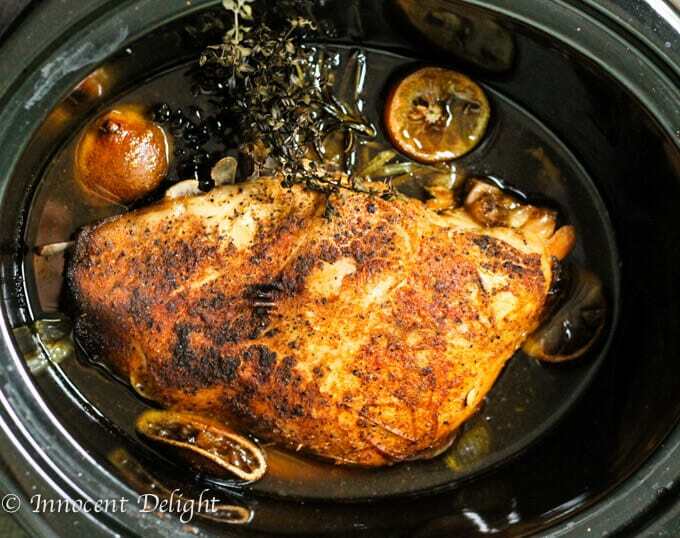 In addition to incorporating seasonal ingredients, I also love using slow cooker in the summer. It can accomplish the same tasks as the oven, but prevents the entire house from heating up too. Another awesome thing about a slow cooker is that you don’t have to watch it (& let me not trivialize this point….it’s huge!). Just set it up, and walk away. Whenever you come back, your dinner is ready to serve. 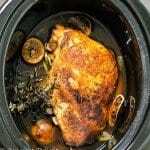 Below I listed some other slow cooker recipes that are very popular on this blog (& in my house). Check them out! 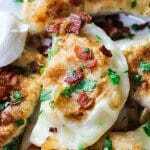 They will make your life easier during the busy weeknight meals. 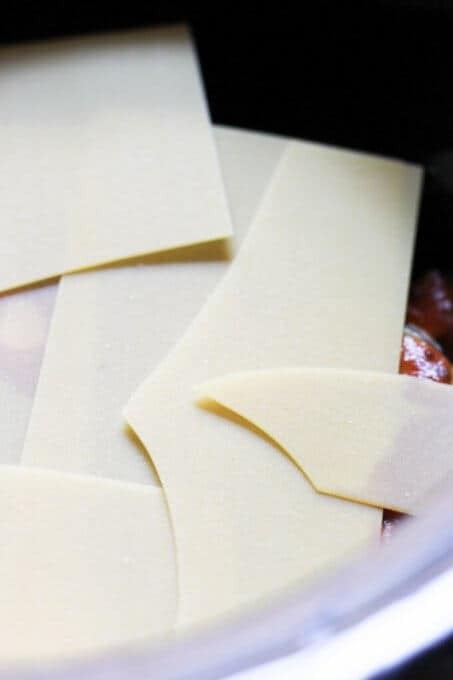 Oh and you can read about the origin of lasagna on Wikipedia. 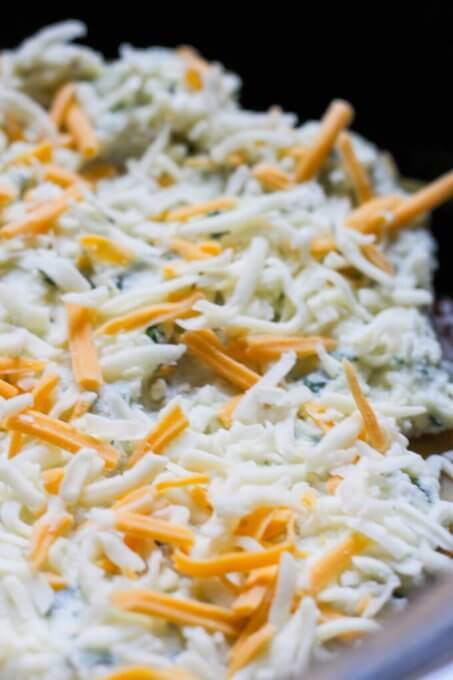 I used 1 cup of shredded cheese but if you like it cheesier feel free to add more on top. 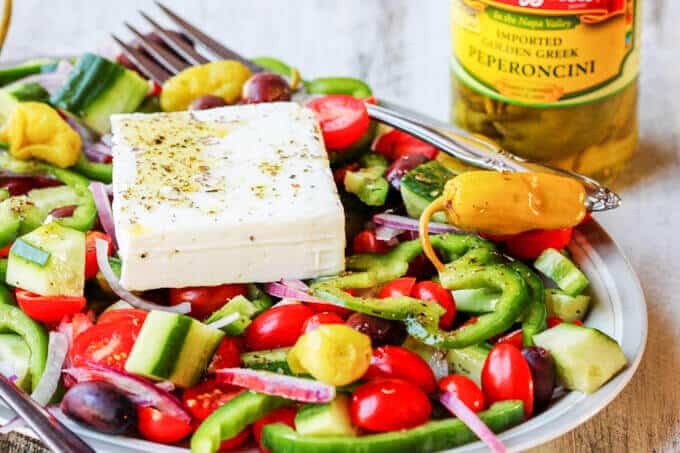 You can accompany this summer recipe with my other summer staple: Horiatiki Salad with Golden Greek Peperoncini + you can enter to win Meal Kit for two, from CHEF’D. Previous Post: « Greek Frappe Coffee – fluffy & chilled coffee goodness. 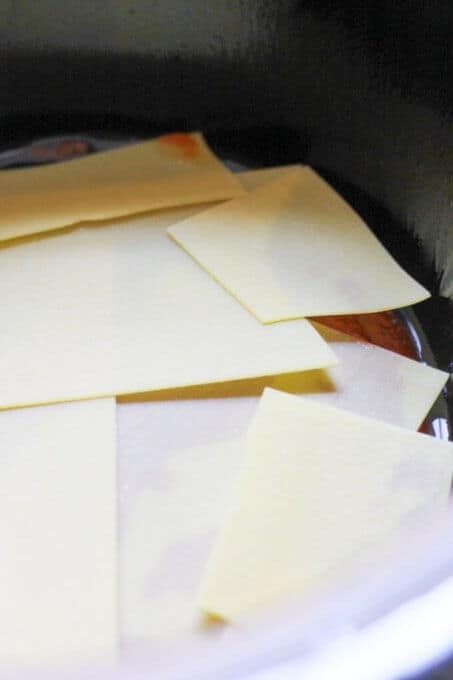 This is one of my favourite things to cook in a slow cooker. So simple, and really comforting too. 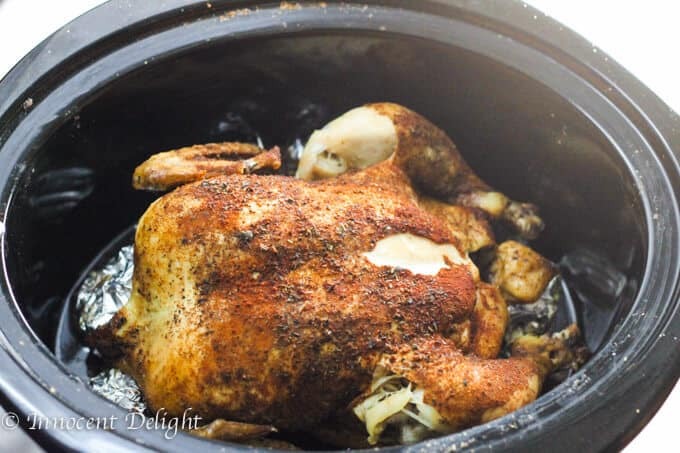 I’m all about using the slow cooker in the summer! It’s been so hot here lately I just don’t want to turn on the oven. This looks so good. 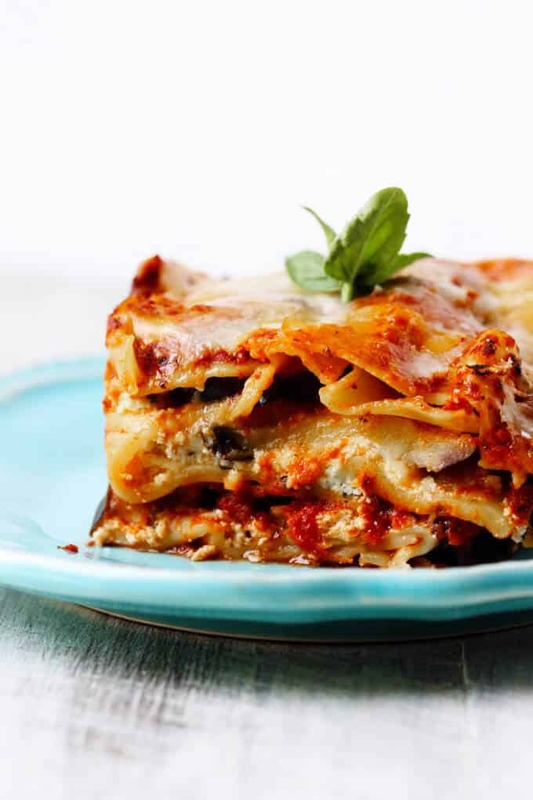 I love the idea of using eggplant in lasagna. 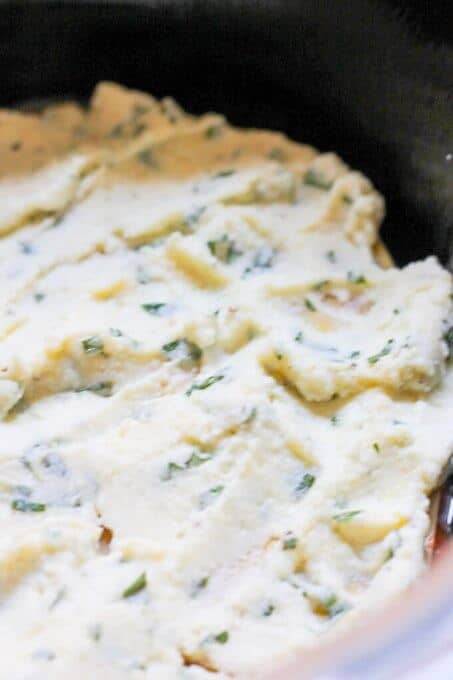 What a great way to beef up the dish with some veggies! 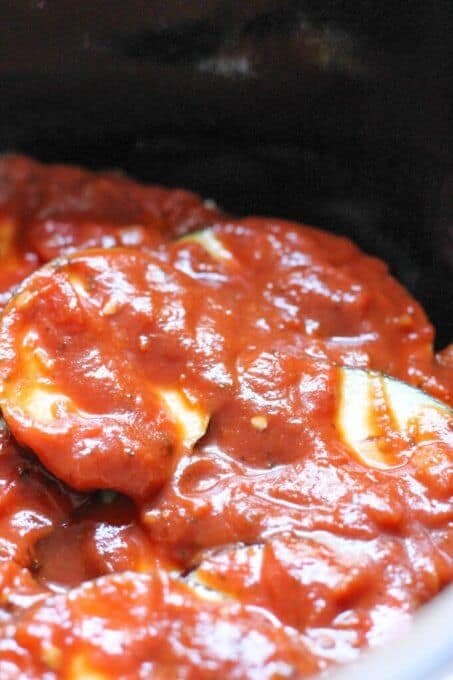 I would never have thought to make this in the slow cooker, but it makes sense in the summer, when eggplants are most readily available anyway. Looks tasty! Oh my! 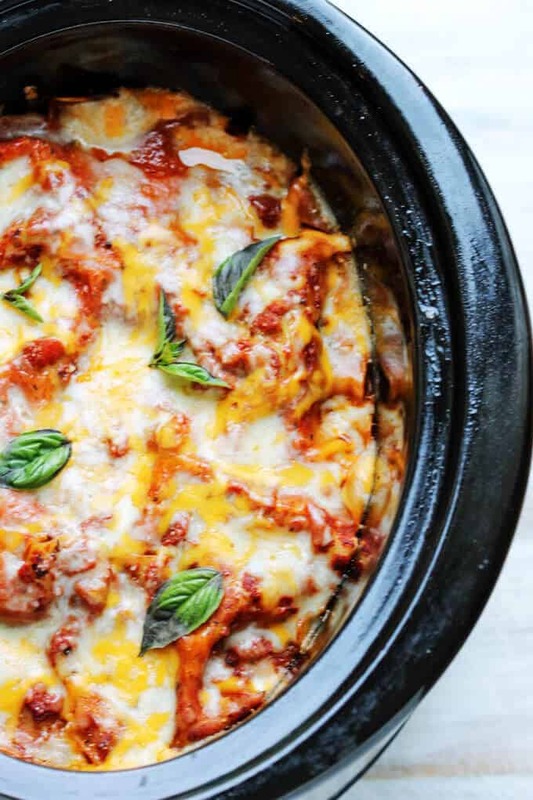 This looks like the perfect slow cooker meal for summer! SOooo delicious! 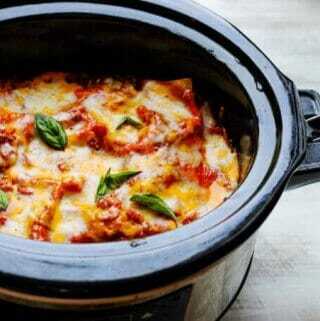 I swear I never thought of using the slow cooker in the summer. Blowing my mind here…..! 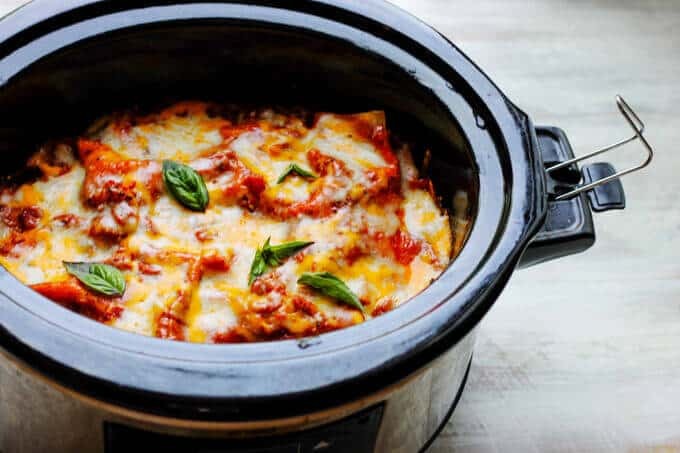 Awesome 🙂 Slow cooker is pretty cool in the summer! Have you ever added meat to the dish to bulk it up? If so how did you do so? I would be fine with just eggplant but I have a carnivorous hubby lol. TIA! Hi Melanie! 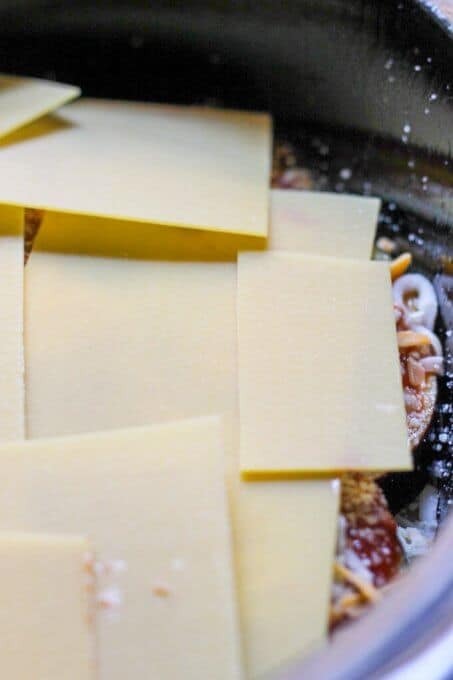 You can add meat easily the same way you would do for spaghetti with meat sauce. 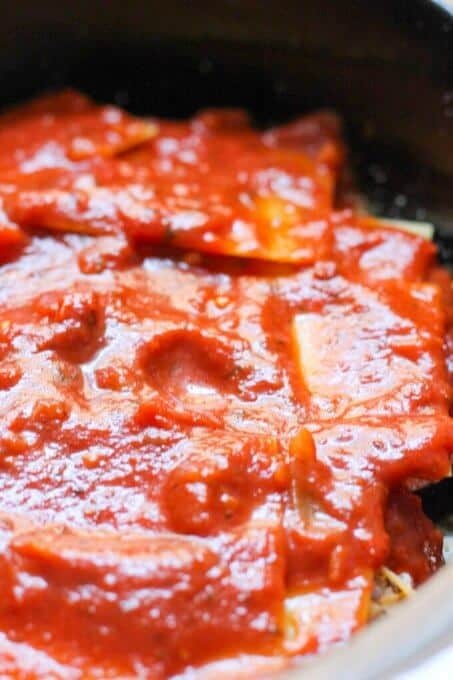 Saute some onions and garlic, add meat and add marinara sauce, season and let cook. 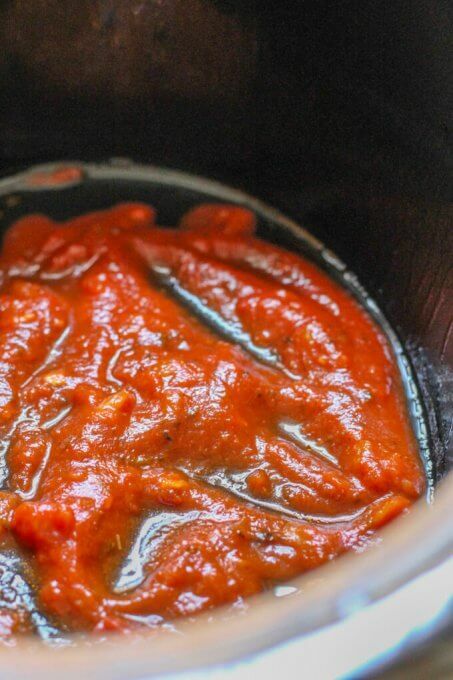 Once the sauce is done use it instead of the marinara in my recipe. I hope it helps! Do you mean cook on high for 2 to 2 1/2 hours or 2 to 5 hours? I hope it is done at 6, I started it at 3 pm. Hi Allison, it should be 2 to 2.5 hours. There was a dash instead of a dot for 2.5. I’m sorry for a confusion. If you started it at 3 on high, it should be done before 6. I hope it came out good. I need to avoid noodles and egg. How would it taste ? Hi there. I think that the ricotta may not be that creamy but it will still be good. 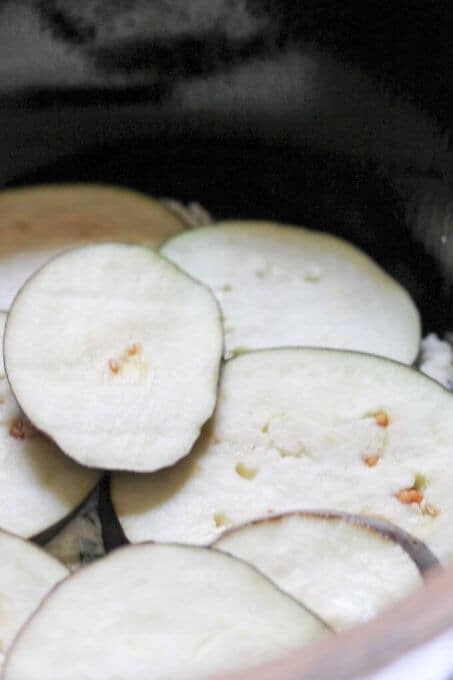 Use zucchini slices instead of noodles. Just keep in mind that while noodles would absorb the liquid, the zucchini will produce more liquid. You may need to use less sauce. I hope that helps.